After a flurry of activity at the end of the National Hunt season, notably the Cheltenham Festival in March and the Aintree Grand National Festival in April, by the time May rolls around it’s the turn of Flat racing aficionados to feel a little hot under the colour in anticipation of the first two Classic races of the season. Currently sponsored by Qatari owned private investment company QIPCO, the Guineas Festival is staged annually, over a weekend in late April or early May, on the Rowley Mile at Newmarket Racecourse in Suffolk, in the East of England. 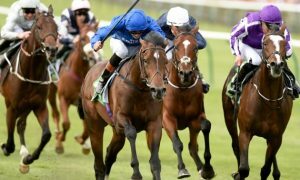 The Guineas Festival features not only the 2,000 Guineas and the 1,000 Guineas – which, together with the Derby, Oaks and St.Leger, comprise the five British Classic races – but a full supporting card which, in 2018, was worth nearly £1.7 million in prize money. The feature race on the Saturday, the 2,000 Guineas, is run over a straight mile and open to three-year-old thoroughbred colts and fillies. The race was first run in 1809, but wasn’t designated a “Classic” by the Jockey Club until five years later, shortly after the inaugural running of the 1,000 Guineas. The 2,000 Guineas took its name from its original prize fund, as did the 1,000 Guineas, but nowadays both races offer equal prize money of £500,000. The roll of honour for the 2,000 Guineas includes such luminaries as Brigadier Gerard (1972), Dancing Brave (1986), Sea The Stars (2009) and Frankel (2011), all of whom were rated 140+ by Timeform and can therefore be considered some of the greatest racehorses since that venerable institution published its first “Racehorses” annual, in 1948. The feature race on the Sunday, the 1,000 Guineas, is run over the same course and distance as the 2,000 Guineas, but open to three-year-old thoroughbred fillies only. One of the most remarkable winners in the history of 1,000 Guineas was Sceptre who, in 1902, won the race 48 hours after winning the 2,000 Guineas and later finished fourth in the Derby before winning the Oaks and the St. Leger.